PA President Mahmoud Abbas said, on Tuesday, that he will not take part in any peace conference on the Palestinian-Israeli conflict that will not be based on international United Nations resolutions. He also said that no one is allowed to speak or negotiate on behalf of the Palestinians. “We are the first and last party responsible for the Palestinian cause. No one takes our place or speaks on our behalf,” he said. 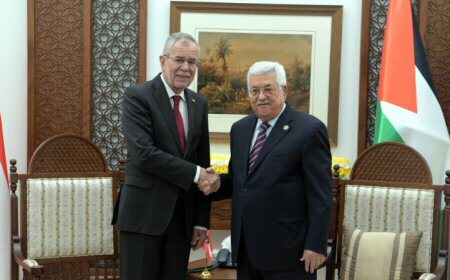 “I have had fruitful discussions with President Alexander Van der Bellen and had put him in the latest political developments in light of the political impasse because of the intransigence of the Israeli government and its refusal to recognize the Palestinian state while it continues with its occupation of the Palestinian territories,” said President Abbas, in his opening remarks. For his part, Austrian President Van der Bellen said that his county, as the European Union, supports the two-state solution through negotiations. “We talked during our meeting about peace in the Middle East, and we know the situation is bad,” he said, explaining that there are many programs that the Austrian Development Agency has been providing for the Palestinians for decades in humanitarian, health and water projects, and there are many programs Austria is supporting through the European Union, such as aid for UNRWA. Upon completion of his visit, the Austrian President laid a wreath at the grave of the late Palestinian leader Yasser Arafat, whom he said he knew for a long time.